THE FEAST OF ARTEMIS is the seventh book in Anne Zouroudi’s very lovely series featuring her mysterious, overweight detective Hermes Diaktoros and his pristine white tennis shoes. 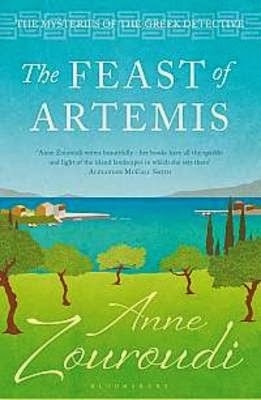 As with her earlier books, Hermes appears in the right place at the right time and gets to the very heart of the matter that is troubling the community with relative ease. Again he is affectionately referred to as “the fat man” throughout the book but this is the first time we see him feeling uncomfortable about his size – and he has to make a trip to the tailors to have his trousers taken out a bit, much to his disappointment. One of the many likeable things about our Greek hero is that he never says precisely who his employer is. He says that he works for “A Higher Authority”, not the police, and doesn’t necessarily see arrest and punishment as appropriate in every case he deals with. I hope we are never told more about this, as I love the air of mystery about him. In this particular tale, Hermes bumps into his wayward brother and goes to a Greek town called Dendra in time for a feast at the end of the olive harvest. Instead of the good cheer he is expecting, he witnesses a bad accident as a young man falls whilst leaping over a bonfire in a contest. He lands in the fire and ends up badly burned. Very disturbed by what he has seen, and not sure it was an entirely innocent accident, Hermes books into a hotel, to stay longer than he had intended, and starts to investigate. He soon discovers a long-running bitter feud between two neighbouring olive growers. The feud has been the cause of much bad feeling between the families and has resulted in the loss of crops, ruined feasts and injuries over the years. Things come to a head when the patriarch of one of these families dies and it looks as if it is in retribution for the “accident” in the bonfire contest. Hermes continues to dig and the truth that he discovers is enough to shock everyone – including the reader. Anne Zouroudi is a very gifted writer and her penmanship makes Dendra and its problems seem very real. I love her descriptions of Hermes, especially when he bends down to clean his white shoes, and was saddened by his frustration at his increasing girth. I hope he is back to his usual cheery self in his next outing and am already looking forward to reading it. I do hope she continues with the series now she's reached the end of the 7 deadly sins.